Welcome to another installment of a segment where we dive into one Elder Scrolls Online’s many Sets, and explore what sort of Builds you can make. Not only will we show you how to get the most from these Sets, but we’ll explain where to get them, what requirements there are to obtain them (if any), and everything else you could possibly want to know about them. In this article we will take a look at the Frozen Watcher Set that deals Frost Damage and has a chance to inflict the Chilled status upon Blocking. This set was added with Wrathstone DLC which launches in February 2019 on PC and March on consoles. This DLC features new sets and two new Dungeons for players to take on, Frostvault and Depths of Malatar. The Frozen Watcher set drops from the Depths of Malatar dungeon. Weapons and Jewelry only drop from the last Boss or Chests. 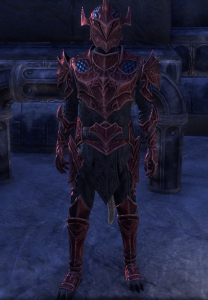 This Heavy Armor set comes in the Meridian Motif Style, which is currently not obtainable, but is expected to be added to the game in June. Frozen Watcher increases Stamina by 2192 and Health by 1206 with 4 Legendary pieces equipped. The 5 piece bonus summons a blizzard around the player when Blocking. The blizzard deals Frost Damage and has a 15% chance to inflict the Chilled Status Effect, which puts Minor Maim on enemies. If you are a player focusing primarily on PvE, the first thing you’re going to want to do when using Frozen Watcher is reduce your Block Cost since you will need to Block a lot in order to make full use of this Set. The cost of Blocking is 1730 Stamina every .25 seconds currently (assuming you are being hit) and you will need to reduce that number significantly or you will not be able to Block more than a couple of seconds tops. Luckily there are many ways to do this. For PvE players (tanks) you’ll want to have the Sturdy Trait on just about every piece of Armor you can. PvP players will want perhaps some Impenetrable, but Sturdy is still a great choice, since they will need to Block often to get the best use of this Set. Secondly PvE and PvP players will want to invest heavily into the Shadow Ward star of The Shadow Champion Tree. There is no hard and fast rule here as to just how much you need to invest, but it is not difficult to get -20% Block Cost reduction from this star. Players will also want to have the passive skill: Fortress in the One-Handed and Shield Skill Line. Maxed out, it will reduce your Block Cost by 36% when you have a Shield equipped. You get nearly 20% around 50 points into this star, so it’s worth doing. Maximum reduction is 25% for 100 points invested. Finally, and most importantly, players should put Glyph of Shielding on your Jewelry. If you play around with Blocking at all, you’ll find there is no way to make it sustainable without them. You don’t need to put them on all your Jewelry, but at least 1 or 2. It isn’t necessary to go for a “perma-block” build, but you will need to reduce Block Cost significantly for this Build to work. Blocking effectiveness was nerfed with Dragon Bones DLC, and with all factors affecting Block cost maximized it will cost around 250 Stamina more per block after the patch, which is quite a significant increase. For more information on Blocking please see this video. How this set works is whenever Block is being held there will be a blizzard around you that damages and has a chance of inflicting enemies with the Chilled Status Effect. There is no cooldown for the blizzard, and whenever Block is held it is active. When Block is down the blizzard stops immediately. Note that this Set cannot proc the Ice Furnace Set. Tooltip damage can be increased to around 1400 at maximum level with 100 points in Master-At-Arms and Elemental Expert Champion Skills. Blizzard Damage cannot crit because it comes from a set, but the damage is done every second, and every tick has a 15% chance to put the Chilled Status Effect. The Chilled effect puts Minor Maim on enemies, reducing their damage done by 15%. The Minor Maim from Chilled lasts for 4 secs. 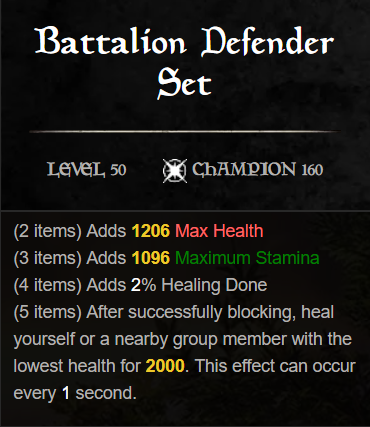 This set makes the most sense for Tanks because they are the ones who will be Blocking constantly. It does everything a Tank could want, regardless of Class choice, by increasing Stamina, Health and the chance to put Minor Maim, which reduces enemy damage. The problem is that the Chilled effect has only a 15% chance to occur, making it quite unreliable. However, the blizzard can affect many enemies at once, so if you are lucky then all could have Minor Maim on them all at the same time. Although Minor Maim sounds great, it can be put on enemies by other means without relying on RNG. 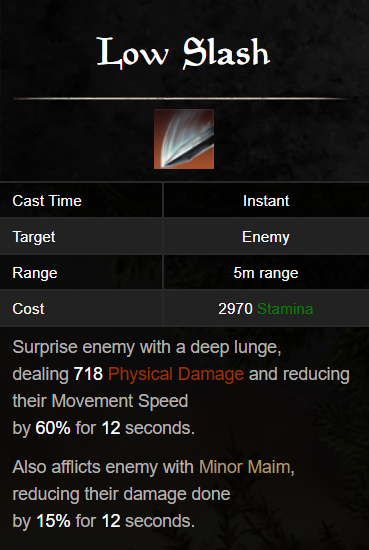 Low Slash, for example, can be used by any Tank and it puts Minor Maim for 12 secs. That is significantly higher than the 4 secs from Frozen Watcher, and it has 100% chance to be applied to the enemy. The trade off is that it uses quite a bit of Stamina, so you’ll have to gauge which is more important. Nightblade and Dragonknight Tanks already have alternatives for applying Minor Maim besides Low Slash. 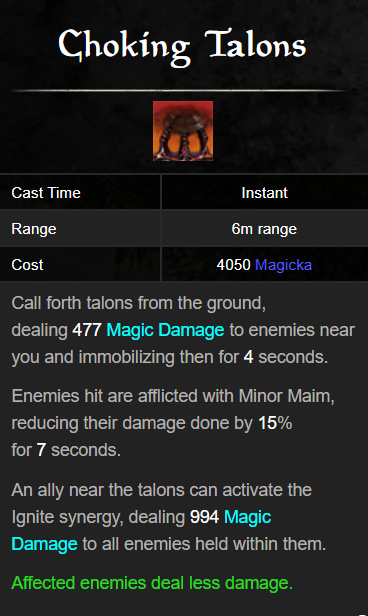 Choking Talons from Dragonknight applies it for 7 secs without RNG, but it requires a lot of Magicka, so spamming it is not possible. Nightblades have 2 ways to apply Minor Maim: Mass Hysteria and Summon Shade. 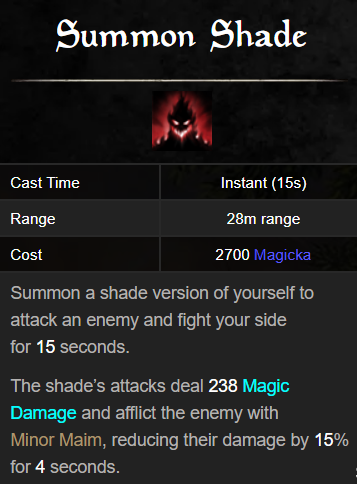 Mass Hysteria has a high Magicka cost but Summon Shade has a very acceptable one. 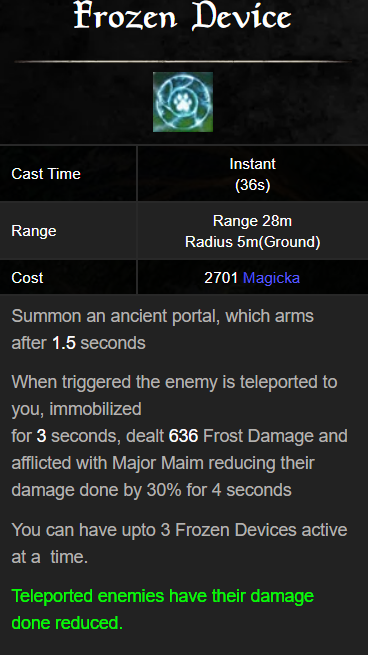 The point is that there are plenty of ways to apply Minor Maim with the upside of no RNG and downside of costing Magicka, at least for these 2 Classes. Frozen Watcher’s stats are great for PvP because of added Stamina. 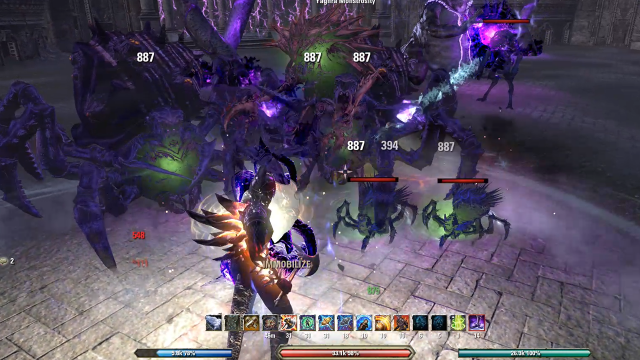 It helps with Breaking Free for all types of builds and roles since there is huge emphasis on crowd controlling abilities in ESO PvP. 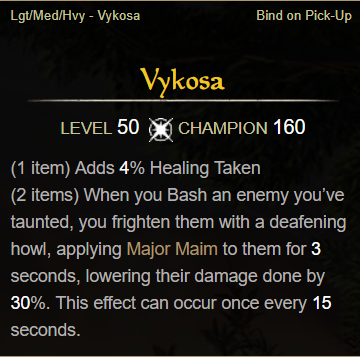 The 5 piece bonus damage is irrelevant here because of it being reduced by half, making it too low to have much of an impact. The Chilled effect, however, is great if it procs. Especially the way blizzard works. By holding Block you can walk as Tank into group of players, Maiming some of them which is very helpful in Cyrodiil when pushing and defending. Holding Block all the time in PvP is a problem, however, even with so much added Stamina. Resource management is key in PvP, and if you can use Block efficiently, this is Set will really shine. Consider pairing this Set with others that help with this issue. Trappings of Invigoration, Stonekeeper or Symphony of Blades are all great choices. Stonekeeper is a great way to gain resources without dropping Block. 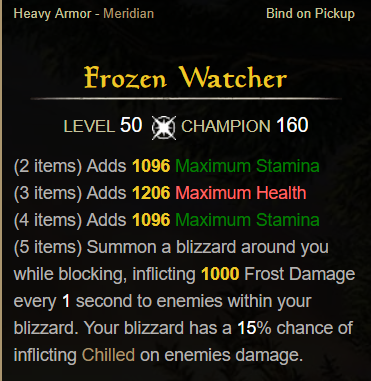 Frozen Watcher is Tanking set with upsides, but also and some downsides. 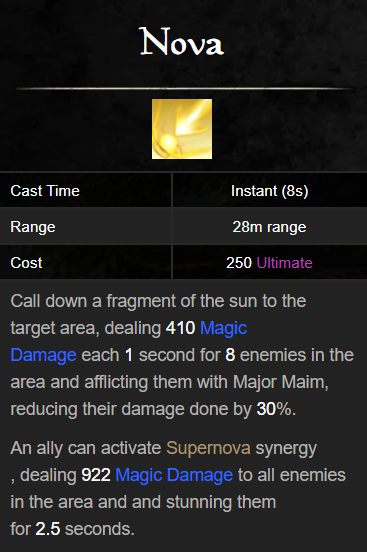 It has Stats every tank would want, and has a 15% chance to apply Minor Maim to enemies around you in a decent AoE. 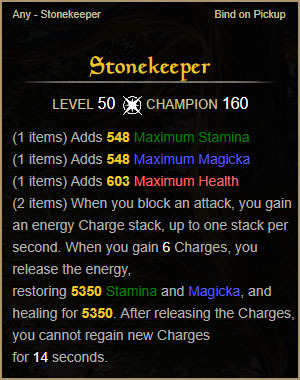 It does not cost Magicka and does not take up ability slots as well, which gives you more possible options in Skill choice. However it is only a 15% chance and it lasts for 4 secs, which is significantly lower than Low Slash whose Minor Maim lasts for 12 secs. 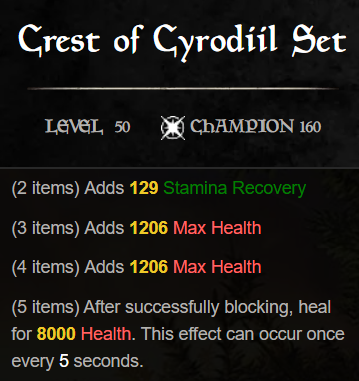 So it is better to just use Low Slash on bosses than hoping for a short Minor Maim duration from this Set. The damage, while nice in PvE, is next to useless in PvP. I see this set used in PvP more than in PvE, and in PvE there are better alternatives as to how to apply Minor Maim. However, Sorcerer, Warden and Templar tanks are classes I could see this set being used on in PvE, because they have to rely only on Low Slash to apply Minor Maim, unless they use the Thurokun Set. Overall this is mediocre set for PvE that is good only in some situations and for some Classes. For PvP it is a good set that can be used to great effect when fighting large group of enemies. I use Frozen Watcher since some days and combine it with a full 5-set of Bahrahra’s Curse. So what I get now is not only a constant stream of damage but due to the high probability of proccing Bahrahra’s 5-Set-Effect, I add additional damage and heal from mit. To give an example: In Skyreach Catacombs, at the chest, I first lure both corners and then activate the chest and I can stand there just blocking until no enemy lives anymore – self healed all the way throught and all enemies being mowed down by the Blizzard. So I’m really happy. 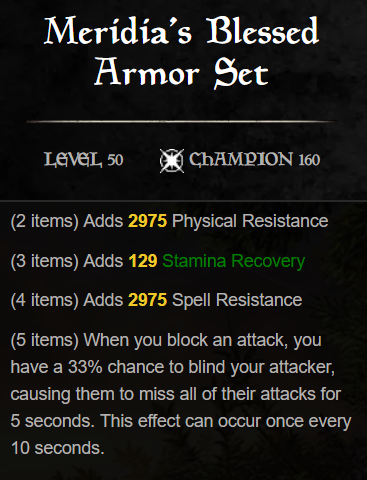 Sure, my former armor set "Thunderbug" worked similar, but based on probability Frozen Watcher deals more damage. The plus point of Thunderbug is: in the scene described above, I could just stand there and the shock damage procced the Bahrahra’s. But I could not survive all the waves to the end. Therefore I must say: Great Set, makes fun, looks awesome and allows some nice Wow effects.